This is a GSX-R brake caliper … the brake item needing service is the master cylinder on the right handlebar. 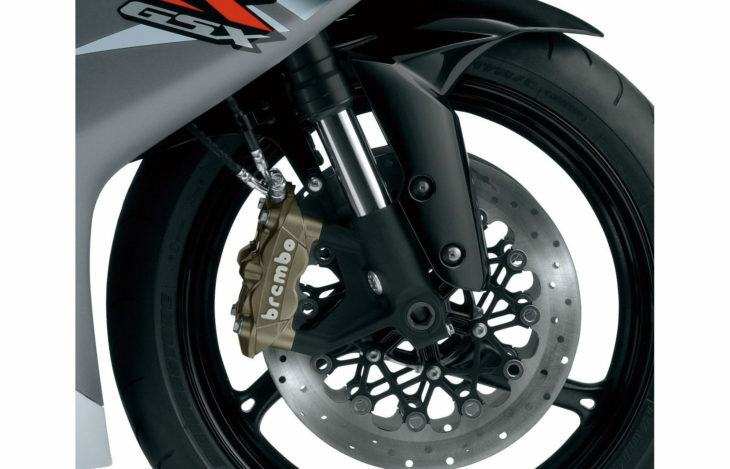 Brea, CA (September 20, 2018) – Suzuki Motor of America, Inc. (SMAI) has announced a trial incentive program to increase completion of a front brake master cylinder recall service on select GSX-R models. For a limited time Suzuki will provide eligible customers a $100.00 Prepaid Visa card upon completion of their motorcycle’s recall service. Brakes…. you mean the coward lever? Yeah…brakes just slow you down. How bad is it that Suzuki has to pay people to service their bikes? I agree with Bob K, Suzuki owners tend to ignore any sort of regular servicing on their bike. Working in the industry for a long time, more times than not, I’ve seen Suzuki’s come in the shop with 20-30k miles that have done nothing but oil changes. Let’s chalk it up to Darwinism and let nature take it course. Doesn’t matter if it’s dirt or street, Suzuki tends to be the most clapped out ill-maintained bike. But the squids will certainly tart them up. I have a funny problem with this recall on my K9: I already use an aftermarket Brembo master. I thought I’d get the recall done when I sell the bike, but got tired of the calls and postcards (they won’t take me off the list), so I went to the dealer with the stock one in a bag. They turned me away because it has to be mounted on the bike. So I don’t know, $100 for mounting and bleeding and get it done? I’m going to guess this has something to do with the lawsuit that Suzuki just lost, where actual and punitive damages totaling several million were awarded. The case involved a GSXR of this generation where the brakes apparently failed in an emergency situation. I hate to stereotype people, no that’s not true… but Suzuki owners tend to be the cheapest cheapskates of the MC world. So much that Suzuki has to offer them 100 clams to come in for a recall on a part that won’t cost them anything in the first place. If I were Suzuki, I wouldn’t worry about them. If they have a master cylinder issue, it’s more likely that the cheapskate owners haven’t even flushed and filled their brake fluid even once. They can pay for a replacement part out of their own pocket when the piston rusts up. Five year old recall covering products as much as 15 years old and now they’re having to incentivize people to get the work done? And you get a free brake fluid flush, no less. Some GSXR fans can be accused of having a rather…studly…attitude. But don’t these bikes make like 130hp and up? I mean. Come up numb scull. It’s your fricken brakes. They are what makes your bike quiet again after you have played with the loud handle for too long. If they don’t work, your bike stays loud. Then it might very well make a really loud bunch of crunching and/or scraping noises. If that happens, you might never hear anything ever again. What’s the recall about, specifically?